This heron is so obliging when it comes to striking a variety of poses. I linger too long when I happen upon him (or her) as there are so many patterns and textures displayed as the heron goes about his grooming. Such a fascinating and changing subject matter. Yesterday, there seemed to be movement in the water and the heron took a dive but emerged without sustenance - which is a shame because if there had been anything in the beak, I would have captured it. This morning, it was all about the grooming. This is a bit of a SOOC hit and run as I am off out for the evening. But I don't think I would have done any editing anyway. Amazing!! I startled one of these this morning as I drove by a pond on our quiet little backroad. It flew out of the pond, then flew in front of my car as I drove for about 30 yards. And of course, no way to get out the camera. I love seeing your shot today especially because of how may morning started out. I would love to get a picture like this Helen - so much detail on the feathers and such a handsome bird. Fav. Few contemporary photos by birders immediately remind me of Birds of America by John J. Audubon. This one does. Fav. I agree, no editing needed by this one. I think I will go out and try to find my favorite heron tomorrow. Fav! Beautiful close up, he is gorgeous. I can see why he is a popular subject. Incredible shot. I love the light and concentration on his face. Instant fav! I especially love the eye, the glint in it! And the texture of the feathers is beautiful. @taffy glad to hear your story and your encouraging words. The heron along the river bank near town is quite assured of its position when sitting on the edge of the weir and never seems to be disturbed by passers by. @flowerfairyann The bird is indeed handsome and strikes an excellent variety of poses. Whilst constantly moving to groom, on a bright day, with a reasonable shutter speed it isn't difficult to get a good shot. You should come to Bedford and find him! @ethelperry Thank you Ethel. The eye is why I chose this particular pose from my selection. @mariapachon I find bird photography very difficult but the Heron is such a big bird and at least stays in one spot for a considerable length of time, so not such a challenge. Thanks for your comment. @onewing Yes - I keep coming back for more of this bird. @justabetina thank you so much. I tried hard to spot focus on the eye when I was taking these shots. @dide @ziggy77 @jerome @ivan @shepherdmanswife @daisyditch thankyou all so much. Each of your comments so much valued and a big encouragement to me. @tracie8266 Thank you for the fav and for looking in. Most kind. @moonmtn Did you find your favourite heron - perhaps not today. They are one of my favourites to shoot because of there being so many patterns that are revealed as the bird moves around. @fotoblah Well I am most honoured that you should even begin to make such a comparison. Thank you - it was a fun shoot. @rosiekind thank you. It is so rewarding when there is no editing to be done! That's beautiful... What a lovely capture. 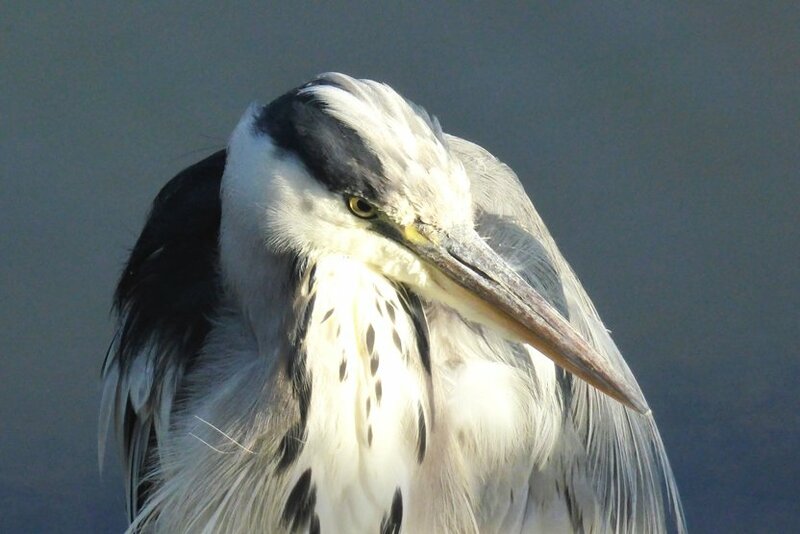 Very nice Heron portrait! Lovely detail to the feathers! Oh this is so beautiful Helen! I love herons, this one is so striking. He (or she?) must be so fascinating to observe, I would spend much time doing that as well! Beautiful - and SOOC too!